The Elegant Cook's method for preparing croques monsieurs appears on the Elegant Luncheon page. I sauté the walnuts and bacon bits in olive oil, to which some balsamic vinegar and seasoning salt have been added. When this mixture is combined with fresh baby spinach, its warmth wilts the leaves to a pleasant degree. I then dress the elegant spinach salad with more vinegar and oil. Beefsteak strips are seasoned (combine your choice of chile powders, comino, seasoning salt and/or onion and garlic powders; shake in a bag to coat meat bits) and fried in olive oil, then served on a sautéed flour tortilla, accompanied by yellow pear tomatoes and sliced avocado. Seasoned ground beef, shredded cheese, lettuce, avocados, tomatoes, sour cream and tortilla pieces are arranged into an elegant, low-carb luncheon dish. 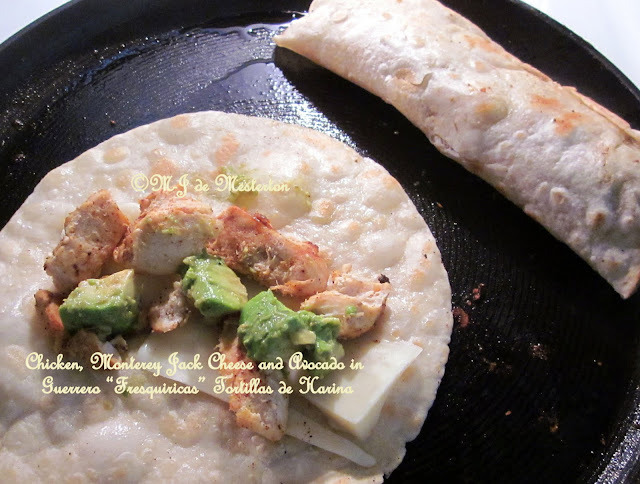 Guerrero of Irvine, Texas: Thin and Elegant Raw Flour Tortillas, "Ready for the Comal (grill-pan)"
Roll and serve with a pitcher of salsa picante (mine is made with Chiles Serranos en Escabeche by La Costeña (México), blended with a can of chopped tomatoes, lime and cilantro). Hamburgers can be elegant when served in buns that you make at home. Please see The Elegant Cook for M-J's original recipe, on the Bread page.